"Enjoyed every step of the way. Wouldn't change a thing. 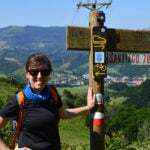 Can't wait to do another Camino We walked from Sarria to Santiago and loved everything about it. Enjoyed the peacefulness, yet had a lot of fun with friends too making it our favourite holiday yet!!! Would not be interested in a regular sun holiday again!" This section of the Camino de Santiago along the French Way, the famous Camino Francés starts in the city of Pamplona (Iruña in Basque), world famous for its San Fermín running of the bulls festival, taking place from 7th July every year. From Pamplona, the Camino takes pilgrims to the photogenic pilgrim sculpture at Alto del Perdón, where you will enjoy fantastic 360 panoramic views of Pamplona, the valley and the vast countryside ahead, before continuing on your way. 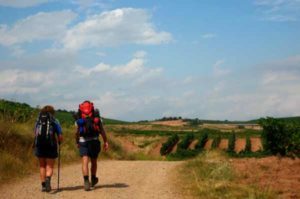 On this section of the Camino, you will walk across the mountains of Navarra and the red earth vineyards of La Rioja, passing medieval bridges, castles, churches and picturesque villages along the way, such as Puente de la Reina, Cirauqui, Estella-Lizarra and Viana. 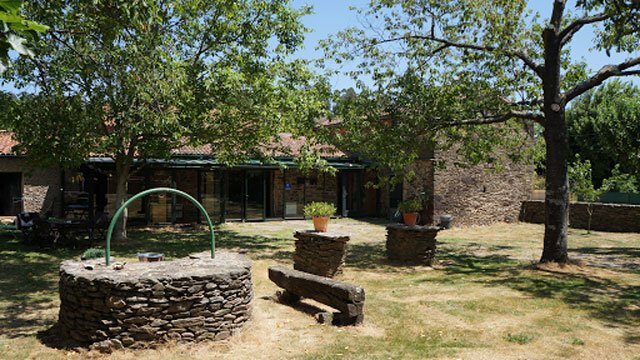 Stop at Bodegas Irache for a rest and a quick sip at the free wine fountain! This section of the Camino finishes in Logroño, capital of La Rioja wine region, and a fantastic city to discover authentic Spanish ‘tapas’. I used Camino Ways for a trip in July, and found them EXCELLENT. It was an unguided walk with hotels, luggage transfer and some meals (breakfast incl, and an optional dinner package). We did 2 segments on the French (traditional) Way. 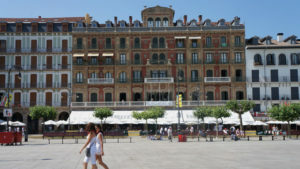 The first St Jean-Pied-de-Port to Estella, I upgraded the hotels, and was quite pleased with the results. After your night in Pamplona, you will leave this beautiful city behind you as , the Camino takes pilgrims towards the ‘Alto del Perdón’ (Hill of Forgiveness) pass. Get your picture taken with the photogenic pilgrim sculpture at the ‘alto’ and enjoy fantastic 360 panoramic views of Pamplona and the valley. 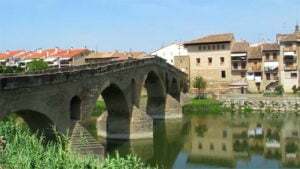 From there, you will begin your descent towards Puente la Reina (Queen’s Bridge) with its quaint medieval alleys and impressive 11th century bridge over the River Arga. After your night in Puente de la Reina, your Camino de Santiago route continues along peaceful tracks for most of today to Estella. 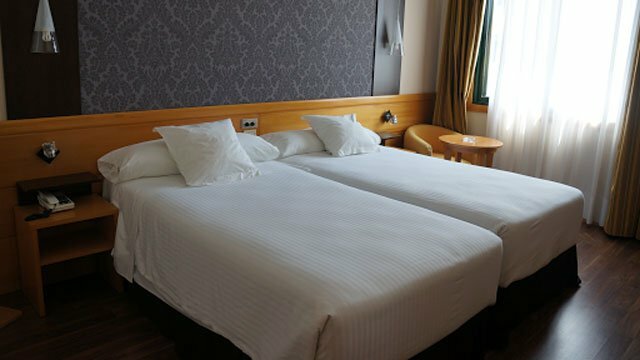 You will walk along rolling farmland, passing small towns and villages nested among olive groves, cereal crops and vineyards. Cirauqui (Zirauki), perched on a hilltop, is a pretty little village of winding medieval streets where you will find one of the best preserved stretches of Roman road. Estella-Lizarra is your finish point for today, a nice historic town with plenty to do and see. After your night in Estella where you will hopefully had a few moments to explore the town and its many monuments, your Camino to Santiago continues to the town of Los Arcos. Just outside Estella you will find Bodegas Irache, the Wine Museum and its free wine fountain, stop for a rest and sip of the local Rioja! Most of your walk today will be along nice tracks, among vineyards, olive trees and cereal fields. 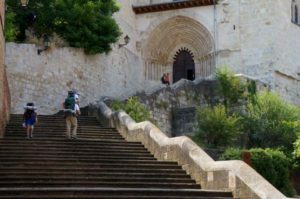 From Villamayor de Monjardín to Los Arcos, you will cover approximately 12kms without passing a single village so make sure you have plenty of water and a few snacks. 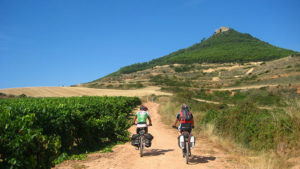 After your night in Los Arcos, you will continue your Camino on a very enjoyable track across rolling countryside, leaving Navarra and entering the world-famous wine making La Rioja region. You will pass the dramatic ruins of Clavijo Castle before entering the city of Logroño, capital of La Rioja and home to some of the best tapas scene on the Camino. Head for Calle Laurel to sample the local Rioja-style specialities. Easy Option:You can split your long stage from Los Arcos to Logroño, into two stages of 18km and 10km, if you would like to walk at a more relaxed pace. 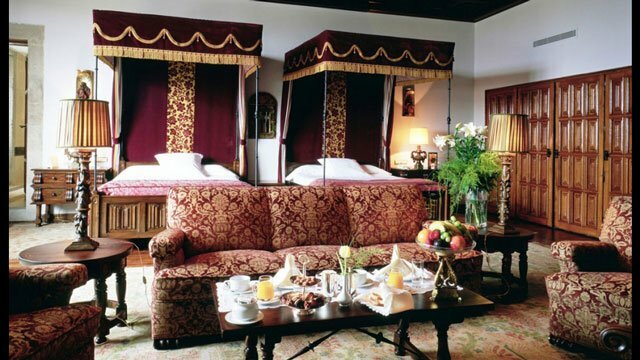 You would stay overnight in a period hotel in the lovely hilltop village of Viana.